Rifle – AR-15 mutt gun that I’ve used for a variety of shooting games. At it’s heart is a 20” Proof Research carbon fiber barrel. It helps provide the weight and balance of a 16” barrel but allows for greater velocities and smoother operation than the shorter barrels. The rail is a BCM 15” which is light and slim, and everything else on the gun is fairly standard. Of importance to me is reliability and being well balanced, which this rifle is for me. The trigger is a Geissele Designated Marksman model tuned to my liking. A Blue Force Gear padded Vickers sling did the trick for shooting and running. Optic – Nightforce ATACR 1-8×24 F1 with FC-DM reticle. A low power variable (LPV) scope is perfect for carbine shooting games with short and long shots due to the 1x magnification for close targets, up to 6-8x for longer shots. The durability and trust in my Nightforce is great when banging the scope around, low crawling with the rifle and more. The ATACR has ED glass, which offers a superb image that’s easy to use and stay behind. I had a solid 100 yard zero and knew my hold overs to 600 yards. While the ATACR is a lot of scope, good glass is a force multiplier that I’ll gladly drag along. Pistol – Glock 17 Gen5. Simply, it works and it’s not too heavy. I’ve used Glocks for a long time and the newer Gen5s are a step up in my opinion. My holster of choice is the Safariland ALS holster, which offers retention while also being super fast on the draw. Magazines were Magpul 21rd PMAGs. These are lighter than OEM magazines, and over the course of almost 10,000 rounds they’ve been flawless in multiple Glock 9mm pistols. Ammunition – Rifle: Hornady 73gr ELD Match ammo. This match had an advertised long range stage with some 300 and 600 yard shooting, so I just simplified on one load that I had good data on. The 73gr ELD Match bullet has a great ballistic coefficient for it’s weight, and they shoot really well in my rifles. Everything else was inside 100 yards, but having the confidence that my bullets were going where I was aiming was a confidence booster. Pistol: reloads with 124gr Berry’s HP over 4.0 grains of Titegroup – this is a go-to load for me that shoots well in all of my Glock 9mms. As a tip, I chamber check all of my hand-loaded pistol and carbine ammo, ensuring that I won’t have any surprises while shooting a course of fire. 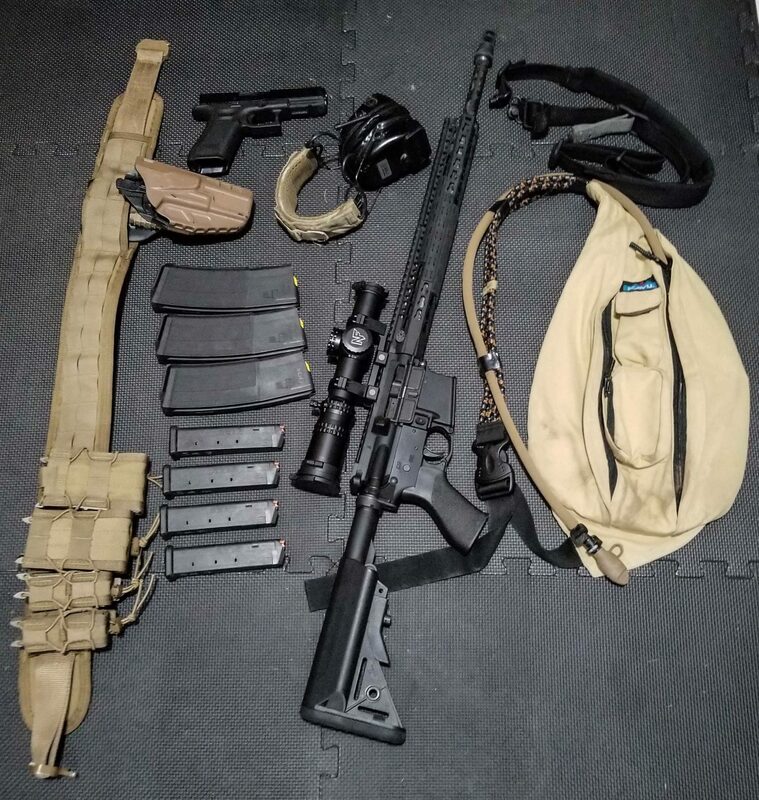 Belt Kit – HSGI Slim Grip belt and pistol/rifle TACOs. I’ve been using this setup for a couple years now for a variety of things and I am super happy with it. The belt has a grippy rubber inside to keep it from sliding around but isn’t too thick and heavy. The TACOs are great as they can be used for nearly any rifle or pistol mag that I use. I cinched down the shock cords so that the mags wouldn’t come out even when hanging upside down. Bag – I debated on this and found an old Kavu bag that I have which worked out to be perfect. This bag is a single strap bag, which I really liked. I didn’t have to take it off for anything but could slide it around to dump depleted mags and grab new ones, or negotiate obstacles. It wasn’t weighted down too heavily, so it didn’t really jostle around when running with the strap tight. I wanted to carry a little water, so I stuck in a bladder with a half-liter of water, and electrical taped the tube to the strap. Notables on clothes – My pants were Kuhl Renegade Stealths which are a softshell material. I’ve used them for a variety of outdoor uses where it’ll be moist or wet out as they help repel water versus absorb it. Despite having to go through a little mud and water, they didn’t absorb any water at all. As for shoes, I used Salomon SpeedCross 4s which offered great traction throughout the course. With some Smartwool light wool socks I didn’t have any blister or hotspot problems with my feet.